New! 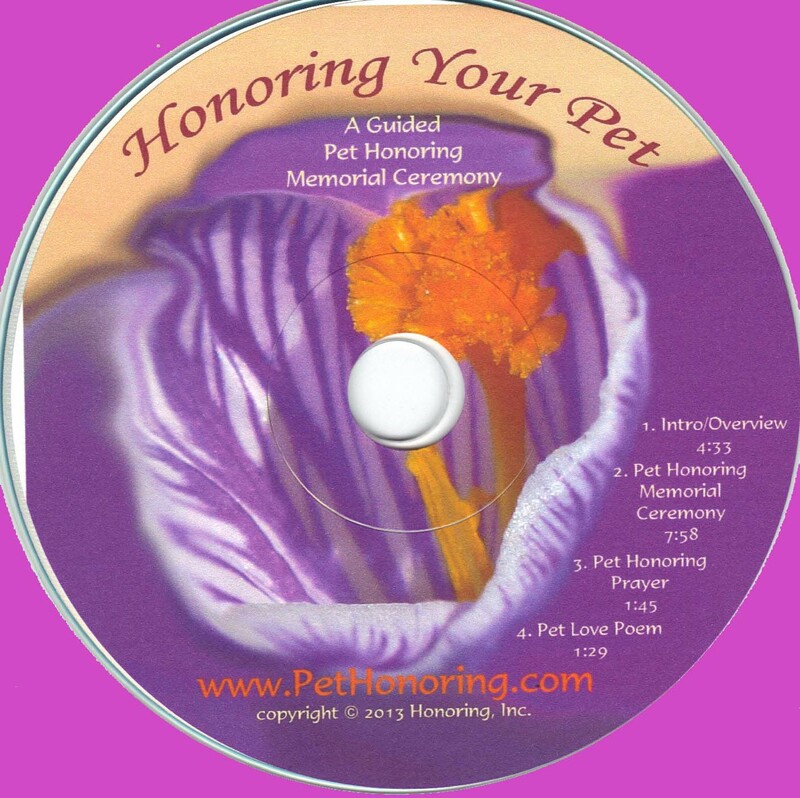 Honoring Your Pet Audio CD – A Guided Pet Honoring Memorial Ceremony. This ‘guided pet honoring memorial’ provides a structure for you to have a meaningful way to honor your pet and a gentle time of giving thanks for them. It is here to help guide the process of sending love, honor and thanks to your beloved pet. Customized Pet Honoring Ceremony available in person or recorded (see below).It is here to help settle your soul, help provide closure and help reconnect you with the love which will always exist between you and your pet. Want to have a pet memorial but don’t quite know how or what to do? Let me help you. After a private consultation, I will create a simple and meaningful ceremony just to honor YOUR pet. The script is customized and tailored to capture and reflect the essence and uniqueness of your pet and your relationship with them. It is then held and recorded for you to listen to in your own space and time. It is a special and wonderful way to have that time of thanks. History: Since 2008, Pet Honoring has been offering and conducting custom designed Pet Honoring Ceremonies. It is delightful that many individuals and organizations have followed suit in dedicating a special time to show honor and reverence for our beloved pets and all they give. Pets deserve it! We are proud to be pioneers in this area and would be delighted to assist you with honoring your pet. Honoring your pet can be beneficial in healing grief from pet loss. Pet Memorial Ceremony Kits are available (for DIY) as well as Private Pet Honoring Ceremonies (in-person or recorded).